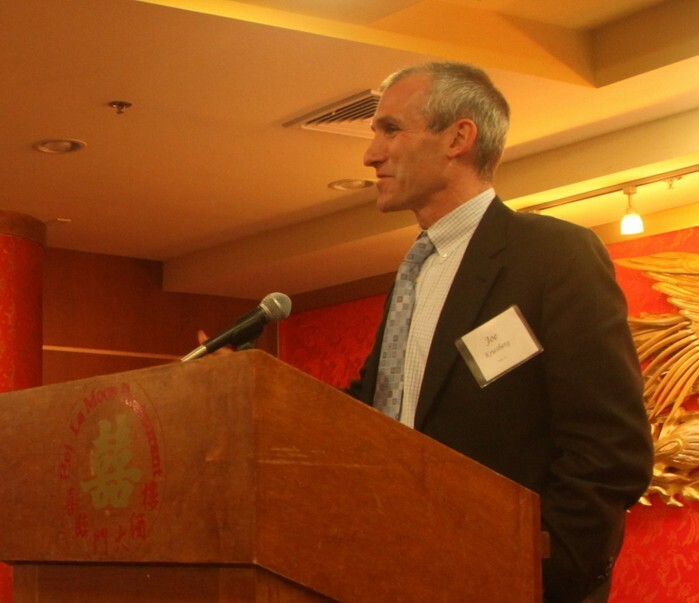 Boston, Nov. 29, 2012, — At Asian Community Development Corporation (ACDC)’s 2012 annual meeting on Nov. 27 in Boston Chinatown, Joe Kriesberg gave a brief talk on the current economical and legal environment for CDCs. Joe Kriesberg speaks at 2012 ACDC annual meeting. Mr. Kriesberg is the President and CEO of MACDC. He first joined MACDC in 1993 as VP, and became president in July 2002. He oversees the agency’s advocay work with public and private sector entities, its capacity building work with members and its long term strategic planning. In his speech, Kriesberg told a story of waiting for Gov. Patrick on his way out at ACDC’s 25th Anniversary Inspiration Gala on April 12 at Taj Boston to ask for the Governor’s support for a legislation called Community Development Partnership Act pending in the Legislature. Gov. Patrick replied: “Why wouldn’t I.” On August 7, 2012, Gov. Patrick signed it into law after it had passed the Legislature. He praised ACDC’s contribution in providing affordable housing in greater Boston area. “ACDC can help ensure every family participate in the recovery, work with them to save money and help each family to reach economic main stream. Housing is going to be a key part of the recovery. When parcel 24 project finishes, you will be the biggest contributor to affordable housing,” Kriesberg said. Prior to working for MACDC, Mr. Kriesberg worked for eight years on energy and environmental issues for nonprofit organizations in Washington, DC and Boston. He has a B.A from Binghamton University and a J.D. degree from Northeastern University. He is a member of the Massachusetts Bar.